Your feedback helps us do better work! 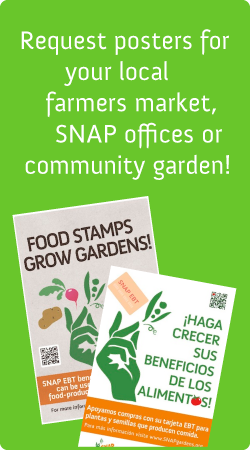 If you've chosen to buy some plants and/or seeds with your SNAP benefits (food stamps,) we'd love to know. Your feedback will help us do better work, and your story will inspire others. Please fill out our short survey as best you can. The more information you can provide, the better. Thank you very much. How many years have you been gardening? Did you garden before you got SNAP benefits? What is the best part of gardening for you? What is the hardest part of gardening for you? If you have a photo of your garden you'd like to share with us, please upload here. Accepted file types: jpg, gif, png, tif, tiff, pdf. You do not need to share your entire address if you do not like. You may share just city/state. If we have further questions, may we please follow up with you?